A new treatment model of psychodynamic psychotherapy pioneered at Upstate Medical University for symptoms of borderline personality disorder, depression, heavy drinking, suicide attempts and self-harm behaviors is now listed on the Substance Abuse and Mental Health Services Administration (SAMHSA) National Registry of Evidence-based Practices and Programs. The treatment, called Dynamic Deconstructive Psychotherapy (DDP), is one of the first types of psychodynamic psychotherapy to be included in this registry of evidence-based treatments. 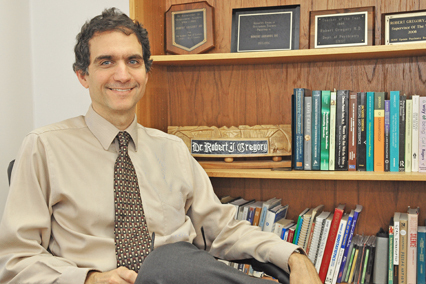 DDP was developed by Robert Gregory, MD, professor and interim chair of Upstate’s Department of Psychiatry and Behavioral Sciences, to treat adults with borderline personality disorder and other complex behavior problems, such as alcohol or drug dependence, self-harm, eating disorders, and recurrent suicide attempts. It involves weekly 1-hour individual sessions over 12 to 18 months and has been shown to help people suffering from borderline personality disorder obtain relief from depression, control over impulsive and harmful behaviors and better social functioning. Dr. Gregory expressed hope that inclusion in SAMHSA’s national registry would provide greater awareness of effective treatments for borderline personality disorder and could lead the way to increasing the number of practitioners trained in DDP. He also stated that the federal posting might lead some insurers to cover a larger percentage of the treatment costs. DDP has been tested in clinical trials at Upstate over the past decade. As part of the evaluation by SAMHSA, independent reviewers rated the strength of the evidence supporting DDP outcomes. They rated the quality of the research as roughly equivalent to that of cognitive-behavioral treatments, such as dialectical behavior therapy (DBT), for most outcomes. Research studies on DDP have won awards at national meetings of the American Psychoanalytic Association in 2010 and 2012 for demonstrating effectiveness, as well as demonstrating feasibility of training new therapists in this approach. Like other psychodynamic therapies, DDP pays special attention to emotions, identity, and interpersonal relationships. It combines elements of neuroscience, deconstruction philosophy, and object relations theory in an effort to help clients heal from a negative self-image and maladaptive processing of emotionally charged experiences. A summary of DDP is posted on SAMHSA’s website of National Registry of Evidence-based Programs and Practices.